The marketing team over at DSJ Beverages sent me several samples of their Gamer beverage to try out. I first found Gamer while still attending university in New Hampshire. I had head to the small supermarket, the DUMP, as we called it for some paste, sauce, bread, and meat to make dinner with. When I had finally got to the front of the checkout I saw the Gamer bottles and decided to try it. At that time they only had two flavors, lime and grape. Today I am taste testing one of their newer flavors orange. Gamer orange smells and taste to me what a good orange soda should. It tastes natural, mainly flavored with orange oil or orange skins, and smells like the fruit it came from. Its lightly carbonated but it also holds for a long amount of time. Its complex orange flavor is sweet but also slightly bitter, and fruity but also tart. Gamer orange is caffeine free and contains 100% of your daily B-1, a stress related vitamin. All in all gamer orange was a very good start to my Gamer tasting experience, so if you want you can order yourself some on their website or if you live in the Northeast at select grocery stores. Now I am off to go play some Call of Duty: Modern Warfare 2. 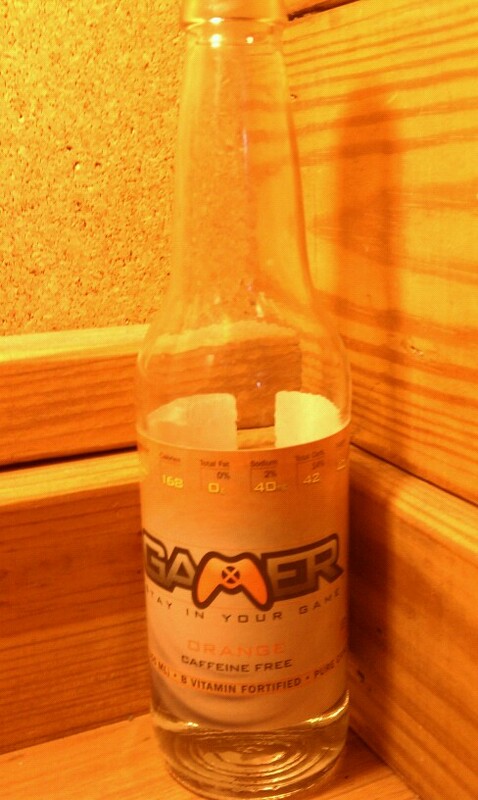 Check out http://gamersoda.com/ for more information.